Dr. Diehl was born and raised in Loma Linda, and feels very fortunate to provide the highest quality of orthodontics in the community where he grew up. Dr. Diehl entered college as an architecture major at California Polytechnic University in San Luis Obispo, and completed three years of study there. He studied neurobiology at University of California Riverside in preparation for his dental degree, and received his Doctorate of Dental Surgery from Loma Linda University in 2002. 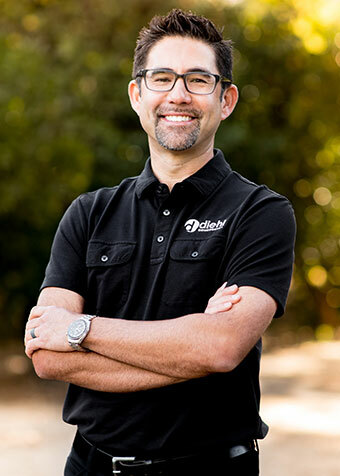 Dr. Diehl practiced general dentistry for two years in Santa Maria before returning to Loma Linda University to further his education in orthodontics. He completed his specialty residency in orthodontics as well as a master’s degree in orthodontics at Loma Linda University in 2006. Dr. Diehl is an active member of the American Association of Orthodontists, American Dental Association, California Dental Association, Pacific Coast Society of Orthodontists, and Tri-County Dental Society. In addition to thoroughly enjoying the profession of orthodontics, Dr. Diehl enjoys spending time with his wife Shani and their 11-year-old son Matthew. Their favorite activities include golfing, skiing, music, and traveling.